Parasaurolophus walkeri - Duckbilled and Awesome! What is the perfect gift for any occasion to please a small boy? Some sure fire hits are cool dinosaur toys for boys. Every man growing up has played with dinosaurs pretending to be a Tyrannosaurus Rex trampling all over the sandbox. A dinosaur gift brings pure prehistoric pleasure to any small child or for any person who is still a child at heart. Not only are dinosaurs a great toy for the imagination; they are educational as well. A dinosaur toy can teach a small boy about the life forms that roamed the earth between the Triassic Period and the Cenozoic Era. 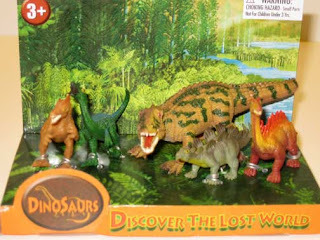 Another educational lesson about dinosaurs that is explained with these toys can be the different theories of extinction. These different theories range from plagues, to giant impacts from asteroids, and global warming or cooling. Dinosaur toys teach the basic predator and prey habits of nature, along with the difference between carnivores, omnivores, and vegetarians. Playing with dinosaur toys allows a child to realize how different each species was from the next, and how each one played an essential role in their ancient world. It also fosters the educational aspect in regards to the vast amounts of subspecies in a group of similar animals. Dinosaur toys can be an easy way to explain the part adaptation plays in evolution. Dinosaur toys teach about prehistoric sea creatures, amphibians, and the first of the land species. But why would a small boy want this toy if it is so educational? Because cool dinosaur toys for boys capture the imagination, energy, and primal nature of a child. A dinosaur toy can come in a variety of species and sizes. The different sizes range from your standard small replica to a seven-foot inflatable with all sizes in between. The most popular variety of dinosaurs for a child in no particular order is the Tyrannosaurus, Brontosaurus, Triceratops, Stegosaurus, Velociraptor, and anything that flies. The most overlooked prehistoric creatures can be animals that still have relatives roaming the earth today. Some of these toy prehistoric animals would include alligators, birds, cockroaches and sharks. There is a cool prehistoric toy for each boy’s individual taste. One aspect of a dinosaur toy’s individual appeal is the vibrant colorful paint that adorns the replicas. There is a creative license that allows a dinosaur to be painted vividly because there is only speculation about what each dinosaur looked like. Since more evidence is turning up all the time that some dinosaurs, especially those in the groups that had hips much like those of modern birds, may have had feathers, the brighter colors might not be too far off base. These toys work so well for play because each dinosaur developed its own different weapons or defense systems through evolution based on survival. This uniqueness allows children to relate differently to each type of dinosaur. Not only are the toys educational, eye-catching and stylish – they’re a lot of fun to play with!